The first assessment of our Idea Lab teams took place on the 31st of March. This assessment focused on the current position of the teams - what have they done so far, what are their future plans and whether they are in need of a mentor. There were 13 teams present, including teams from Pärnu College, Miina Härma Gymnasium and TTÜ. The teams were given 3 minutes to present their progress and address their issues . It was also a great opportunity for the teams to put their newly learned pitching skills into practice. Idea Lab manager, Maret Ahonen, said that she was impressed by the teams' presentations and preparedness. Almost half of the teams presented their work in English. Several teams, like BOMBY, KONKU, Need2Park, Notebase and LiveCool, had already created prototypes or product examples. The jury consisted of seven judges: Idea Lab manager Maret Ahonen, UT Entrepreneur and Innovation Hub manager and marketing-guru Andres Kuusik, UT Entrepreneur and Innovation Hub senior specialist Piret Arusaar, head of UT Pärnu College Idea Lab Taavi Tamm, UT entrepreneur career counselor Aivar Pere, a seasoned entrepreneur and consultant Jaak Lippmaa, Idea Lab alumnus and startup UPGrlD founder Laur Lõhmus and UT Idea Lab development manager and the head of several businesses Kuldar Leis. The jury recognized all teams and their hard work and the jury's feedback was highly appreciated. The possible future directions of the teams were discussed using open dialogue but the final decisions will be made by the teams themselves. The role of Idea Lab is to offer continuous counseling and mentorship. 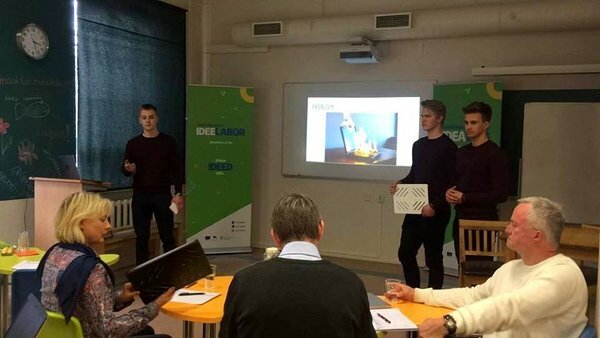 Marten Tamm, who is a member of Notebase, the team from Miina Härma Gymnasium, said that the jury's feedback gave his team's next steps more clarity and purpose. Their first goal is to focus on product design and marketing. Marten Tamm also pointed out that they need to perfect their business plan and consult different retailers to find out whether their plan has any sustainability. This company run by students called Notebase produces comfortable laptop stands with a modern design. Ut Idea Lab's next workshop "Product and Service Design" will take place on the 7th of April at Garage48HUB. The speaker will be Yrjö Ojasaar, a councilor and mentor of Startup Wise Guys and GameFounders. He is also one of the managers of Solon Partners Ltd and a member of the board of directors at Prototron Investments.